Located at Trou aux Biches in the north-western part of Mauritius Island, Blue Safari Mauritius offers you a unique undersea adventure in the magnificent waters outside this coastal village. These remarkable underwater adventures can be experienced by anyone who wants to explore the splendid and diverse marine life of Mauritius in the safest way possible. 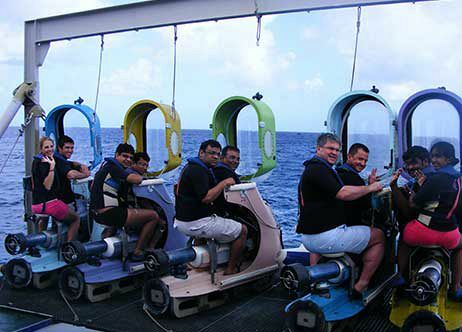 There are only 12 leisure submarine operations in the world, and Blue Safari Mauritius is the only one, not only in Mauritius but in the entire Indian Ocean. Even if you are not a swimmer or diver, you can still enjoy the bountiful marine ecosystem through a breath-taking 35 metres dive in a submarine or a 3-4 metres dive in a subscooter. A blissful treat indeed! Besides, you have a wide array of submarine activities such as the submarine trip, including the options of having an underwater lunch and champagne. You can equally go for an underwater scooter adventure, while the romantics may even choose to have a unique and memorable undersea wedding. You will undoubtedly see from close enough vivid coloured sea turtles, shoals of fish, colourful and majestic coral reefs, and not to forget, the amazing Star Hope Ship Wreck, and a 17th century anchor at the bottom of the ocean. All of which make up the real treasure of the Indian Ocean! Blue Safari promotes unique leisure submarine adventures, and operates 2 submarines of small sizes, maximum capacity being 5 and 10 seats respectively, offering therefore a real personalized adventure not to be missed while being in Mauritius. The submarine are air-conditioned with fully transparent-glassed cabins so you will enjoy exceptionally clear panoramic views of the extraordinary underwater world. Each has been designed so that every passenger benefits from an individual observation window for viewing outside on the wonderful underwater world. There is also a camera situated on the submarine’s bridge which projects the great views from outside through a TV screen located inside the submarine, giving you an additional view of the marine life. All submarines are approved and certified by the international authorities for design and safety at sea. If you wish to experience an absolutely memorable under water trip choose the BS 1100, which is a 7.5 metre long, 10-seater submarine specially designed to give you a great under-water view through individual windows. The seating area is similar to the inside of a small plane, so you are comfortable at all times. There’s also a TV screen on board that shows images from a camera on the outside, so you won’t miss any of the wonderful sights. This submarine will take you to the wreck of the Star Hope where fish, eels and crabs have made themselves at home. The trip lasts for a total of two hours, and for 35 to 40 minutes you will be under the magnificent ocean experiencing the most awe-inspiring attraction in Mauritius. At the end of the excursion, you will be given a certificate signed by the pilot and a refreshing, non-alcoholic drink. If you are looking for a more exclusive experience, the BS600 with 5-seater offers a huge, panoramic window used for couples, families and special occasion trips. Ideal for holiday special treat, the BS600 has room for up to five passengers and the large window at the front gives everyone on board a wide view of ocean 35 metres below sea level. The pilot can take you to the wreck of the Star Hope, or to another reef area, depending on your interest. Your journey will start on a speedboat- the Vaporetto driven by an enthusiastic skipper from the beautiful beach to the large platform at sea. Once on board the submarine, you will find ultrasound phones which facilitate communicating with the submarine staff. The journey inside the Blue Safari in Mauritius lasts for approximately 40 minutes. This entire tour among the multi coloured fishes is mind blowing and soothing to everyone's eye. Apart from the marine life, the sprawling exotic corals make the trip in the Blue Safari a memorable experience. To add an extra special touch to this wonderful excursion in Mauritius, Champagne can be served on board for a party of up to four people, while enjoy the underwater journey. 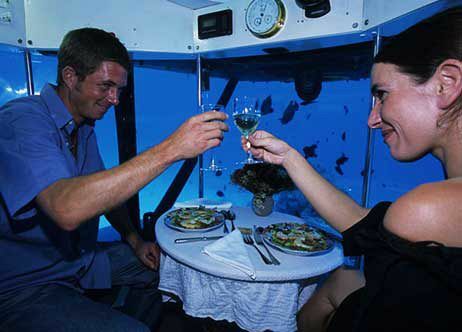 Blue Safari also offer an under-water fine lunch experience. A fine meal with good wine will be served by the driver for a one-of-a-kind experience. A wonderful way to celebrate an anniversary, a special birthday or an engagement! For a wedding day to remember, you can exchange vows 35 metres under the Indian Ocean. A 30-minute ceremony can all be caught on camera from outside the submarine, in video or still photographs. Blue safari is also open to any personalized suggestion as long as it doesn’t compromise with your safety on board. Blue Safari Mauritius has several subscooters for its clients. You can ride your subscooter solo or seated one behind the other at a leisurely 3 km per hour. You can breathe naturally under water through a shared bubble which gives you a 360 degree view through the glass. Enjoy watching the colourful fish as you move along three metres under the Indian Ocean. Travel two people sharing a sub scooter. Children as from 8 years old must be accompanied by one adult (mandatory). Drive along the sea bed of the Indian Ocean with the Blue Marine sub scooters by yourself or as a couple to 3-4 meters depth in full safety for a unique experience! You don’t need to be a swimmer or diver to take part, and all instructions are given to you before you set off. The underwater scooter is very easy to pilot, with a steering wheel, two accelerator pedals and a single button to control the depth level. You only need to press the button to dive or to go up to the sea surface, as easy as that. Comfortably seated one behind the other (one or two people can ride the scooter together), on height adjustable seats, you can breathe normally inside a big broad common transparent and panoramic glass dome and enjoy a 360 degrees panoramic view. The underwater submarine scooter continues starts with a boat trip to the operation platform. You will have a 15-minute training session before being fitted with a wet suit provided by Blue Safari. A diver swims alongside you to make sure you get the best experience, and to ensure you are safe at all times. Once ready, you will enjoy a full view of the reef and of the marine life of Mauritius and will discover its marine flora and fauna. Upon your return on the platform, you will have the opportunity to freshen up and wash off the salt in the changing room provided with showers. Exclusive Scooter Cruiser Experience for up to 4 people, Pictures of your Scooter Adventure on CD, towels, complimentary Cocktail, Soft Drink, Tea or Coffee, homemade snacks and cakes. All submarines and subscooters are approved and certified by the international authorities for design and safety at sea. Each submarine, guided by a knowledgeable pilot, can dive to 35 metres. Each subscooter is monitored by a professional diver, and can dive to 3-4metres. Both vessels are safe for children as well (Kindly refer to age requirements below). Bring along: Please bring your own bathing towel, shorts or swimwear and on the scooter it is wise to wear flat-heeled shoes. It all started by two passionate Frenchmen, Luc Billard, an ex-competitor of the fabulous Whitbread Round the World Yatch Race (1976-1977), who created submarine tours with a single submarine for five passengers. In 1998 he started this exciting submarine adventure. Ever since Blue Marine has expanded to become a multi-site, unique tourist attraction with two submarines and a fleet of underwater scooters. Luc Billard is an experienced sailor, world-traveller and co-founder of this exciting underwater excursion. He began sailing at just eight years old, spending most of his childhood surrounded by lakes and boats in France. In 1977/78, he took part in the Whitbread Around the World Race – now known as the Volvo Ocean Race. 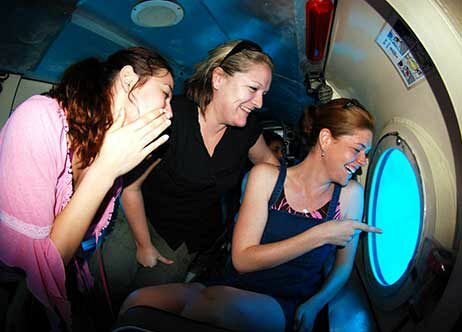 For two consecutive years of hard work, Blue Safari opened its doors with a submarine taking tourists on an under-the-sea adventure. Just one and half year later, a second submarine was added, and in 2005 under water scooters were introduced as well, being created by Luc Billard. Now more than 300,000 delighted visitors have enjoyed an experience to remember in Mauritius. The team consists of more than 50 people who are all trained and experienced. The hostesses are on hand to explain, with a smile, everything about the excursion from start to finish. They will let you know what to do and when, so you enjoy the experience and learn a little something too. A pilot guides, the submarine around, and is fully trained to make sure you are safe at all times. They are also educated in marine biology. For the sub-scooter, there are fully-qualified divers present to make sure you enjoy your time below the sea. There are also quite a few crew members to help and a large maintenance team, making sure all the equipment is working as it should.